A long standing feature request of the Launchpad Greasemonkey Scripts project has been the ability to share stock replies. We have a bunch of commonly used responses, but they don’t exist in the stock replies greasemonkey script unless you entered them yourself. Well, I should say didn’t! because, thanks to Kees (with a wee bit of help from yours truly), now they do. The script grabs an xml file which contains the majority of the commonly used responses. These are then added to your existing stock replies or used to preseed them if you don’t have the script installed. Additionally, if the xml file is updated you can also pull in the changes by clicking “+reload+”. If you don’t want to do the work of clicking “+reload+” the script will check for you every three days. The editing of stock replies has also been reformatted so it is easier to read and edit the comment being added to the bug report. So install the latest version by clicking on the green download arrow on the right hand side. In the event that your favorite response is missing from the xml file please file a bug about the launchpad-gm-scripts project and I’ll get it added. I recently updated the firefox-launchpad-plugin in Jaunty, with Steve Beattie’s help, to include a search for bugs in Launchpad using a bug number and a shortcut for a package’s bug listing page. 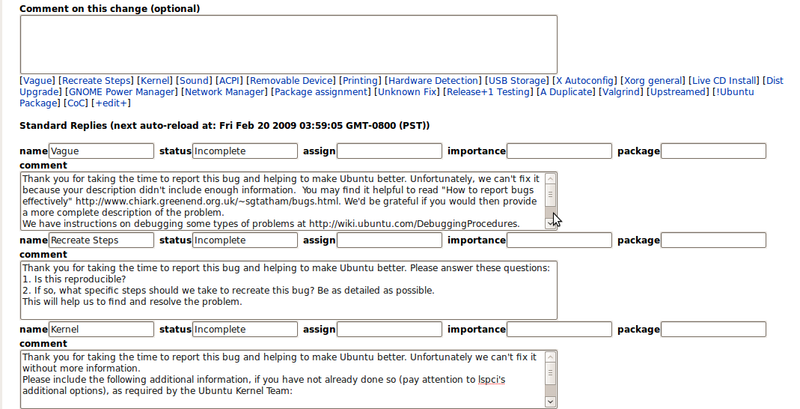 The latter is much easier than url hackery of http://bugs.launchpad.net/ubuntu/+source/calibre. In addition unique images, the same as those used in Launchpad, have been added so it is easier to identify each search. For those of you still running Intrepid it is possible to install the Jaunty package. Additionally, the keyboard shortcut for accessing the search is Ctrl+k and Ctrl+ arrow key moves up or down in the list.